Rowena Ardern creates contemporary textiles and textile designs for interiors. Her unique images celebrate nature and beauty in its many forms capturing the essence of a place. They are drawn from life then translated onto cotton and silk textiles through hand and machine embroidery, print and hand painting in her South London studio. She is an expert colourist. With a first Class Honours Degree from Manchester Art Schools prestigious Embroidery BA course ,Rowena completed an MA Design (Textiles) at University College Falmouth before moving to London to set up her own studio 5 years ago.She has exhibited widely and sells her work through her website , local shops and a variety of events throughout the year . Products include cushions, tea cloths and framed wall pieces as well as cards and notebooks. 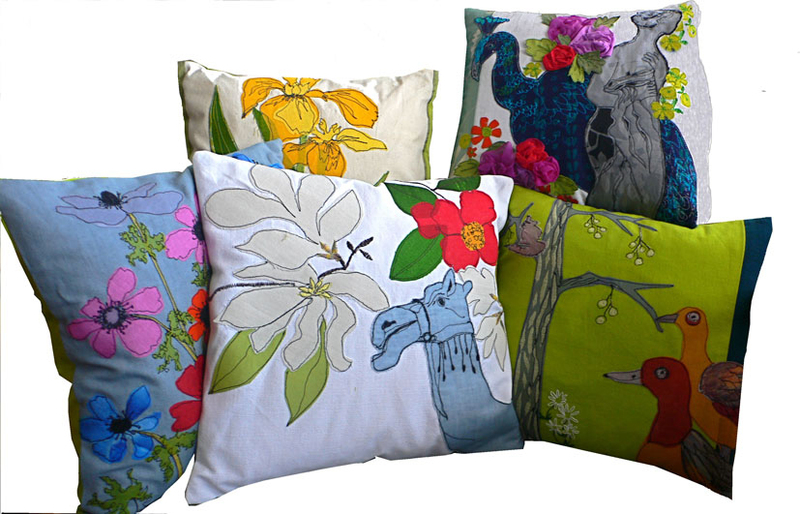 Individually hand made cushions developed from drawings in and around London.